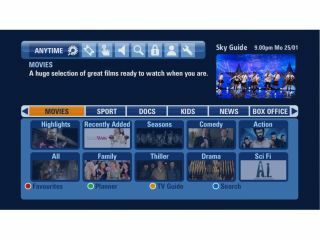 Sky has confirmed that it will be bringing major HBO series to its Sky Anytime+ service in 2011, tying in with the launch of the eagerly anticipated Sky Atlantic channel. Sky told a media briefing that it 'box sets' of HBO content including The Sopranos and The Wire would be made available on its new Anytime+ service. This is a major boon for Sky's latest launch, which is currently sitting pretty in terms of movie content but looks light in terms of television shows. Currently, Anytime+ has little more than a selection of Sky commissioned dramas, but the company is working hard to get more. "We are in talks with third parties, explained Sky's Kathryn Downward. "We will continue to look for the best content." This means, of course, that we are likely to see a scrabble for the pick of the world's best content – although it will be the major US series that attract the most interest. Sky has proven its commitment to US television by snapping up the major shows – like Bones, The Simpsons and Lost – but will need new deals to show them as VoD. Meanwhile, Virgin Media's mature on demand service already has major television series available, but it remains to be seen if Sky's purchase power can soon change things around.